You are here: Home / Dogs / Please Welcome … Allie! This beautiful blind and diabetic girl arrived two weeks ago from Virginia. And if all goes well, in just a few days she will be able to see again! Allie’s story is an all-too-familiar one: Her elderly owner passed away, and a week later, the family planned to take Allie to their vet clinic for euthanasia. But the story didn’t end the way so many of them do. 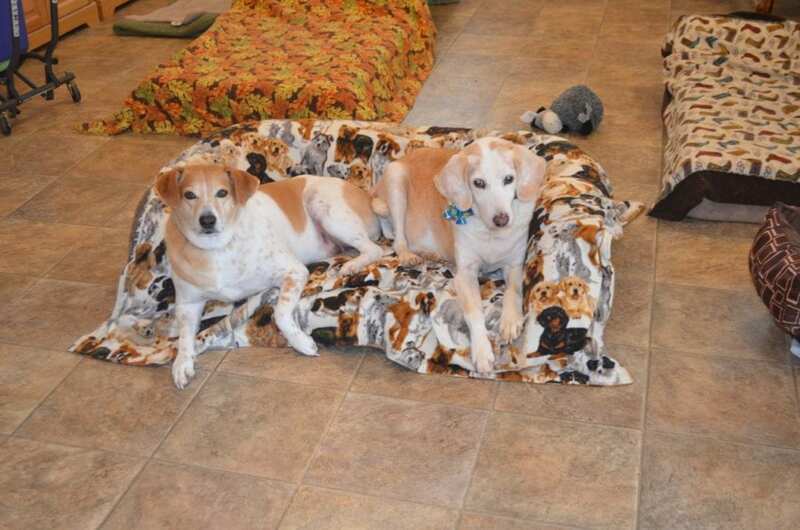 Allie had been staying in a boarding kennel in southern Virginia while her owner was in the hospital. She had been boarded at this kennel off and on for a number of years, and the kennel owner, a wonderful lady named Joan, was horrified to find out that the family was going to euthanize Allie. 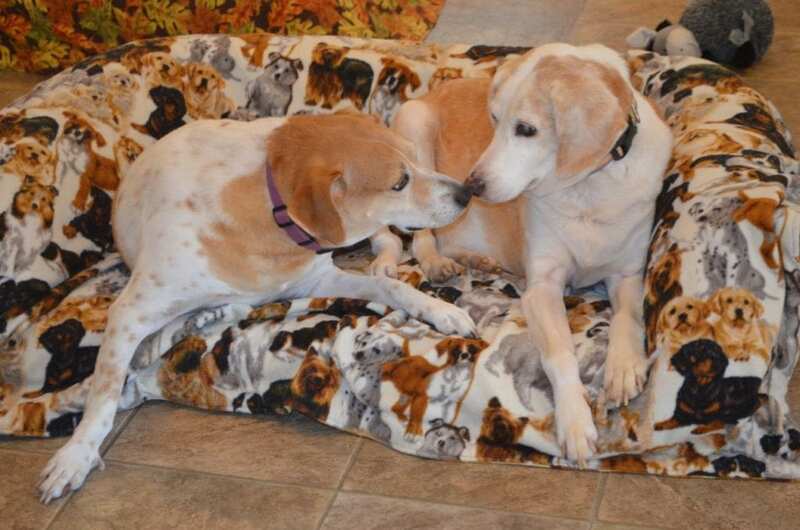 Joan put word out in the local rescue community that she wanted to find a home for Allie. Another caring lady named Vicki heard about Allie’s plight on Facebook and contacted us. We called Joan and offered to give Allie a home here, if she could get the family to agree to surrender Allie so we could make this happen. Fortunately, to their credit the family accepted and sent Joan their agreement in writing. Our pet transport company couldn’t get there for a couple of weeks, and we told Joan we wanted to pay for all of Allie’s boarding costs, but she wouldn’t hear of it. On Martin Luther King, Jr. Day, the pet transporter picked up Allie first thing that morning and safely delivered her to us that night. Allie is as sweet as she is beautiful. She’s also one smart girl. In her first 24 hours — after we had walked her out just a couple of times on a leash — she figured out how to find her way to the back door, go down the ramp, turn left to go across the deck, turn right to go down the next ramp, and out into the dog yard … and then back again, all on her own! He’s delighted to have a new girlfriend! She’s very affectionate, and loves to come up to us and press her head into our laps while we pet her. When we come into the house from barn chores, Allie’s right at the door, along with Tanner, Daisy and Millie, eager to greet us. (The others, um, prefer to remain sleeping.) She’s also crazy about going for walks, no matter how cold or snowy. For a dog from the South, she really enjoys the snow … when she’s not rubbing her face on the nearest snowbank, she’s lapping up snow with her tongue. 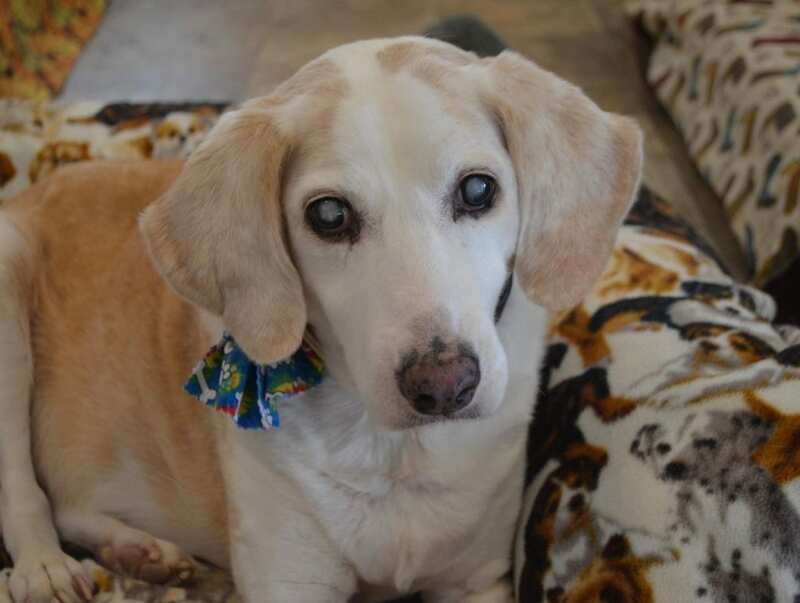 Allie was diagnosed in February 2018 with diabetes, and then in August last year with bilateral cataracts. (With Allie, we’re back to having three diabetic dogs.) When she arrived we had a hunch she might be a candidate for cataract surgery because she gave us a great dazzle reflex when we shined a light in her eyes — this meant her retinas were detecting the light, even through those thick cataracts. I took her intraocular eye pressures and they were normal, which meant we didn’t have to worry about glaucoma at this stage. 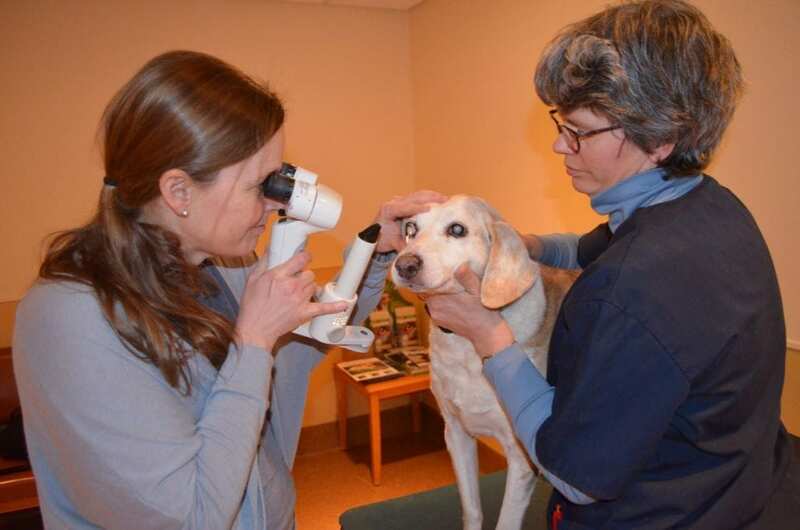 We had earlier scheduled a full medical work-up for Allie at Peak Veterinary Referral Center in Burlington, so last Wednesday I took Allie there for her appointments with our internal medicine specialist, Dr. Marielle Goossens, and our veterinary ophthalmologist, Dr. Sarah Hoy. Allie also saw our veterinary surgeon, Dr. Kurt Schulz, because we had noticed Allie had an odd gait in her hindquarters. Sure enough, Dr. Schulz found she had torn her cruciate ligament in her right knee, and X-rays revealed her left femur had been fractured at some point in the past, along with a 9th rib. We have no history on what kind of trauma might have caused that. Allie may have cruciate ligament surgery in her near future. Allie’s blood work looked great, and tests showed her glucose is pretty well regulated at this point, so we will be keeping her on the insulin dose she was on when she arrived. She had several masses — enough that Dr. Goossens created a “body map” to identify and keep track of them — and all except one turned out to be fatty type tumors. We are awaiting the pathology report on that one other mass. Dr. Hoy also got a very nice dazzle reflex from Allie, found her eye pressures normal, and then proceeded to ultrasound her eyes to see if anything else was going on inside. 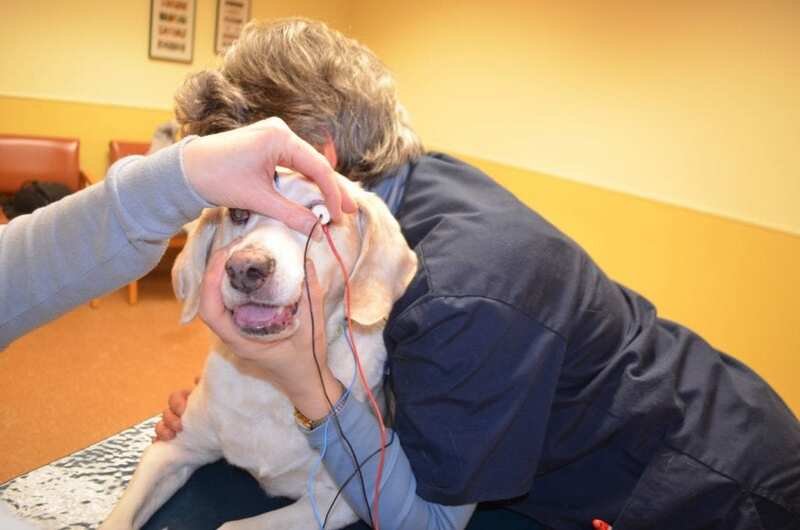 Allie kept passing the tests, which set her up for the big one: The electroretinogram, or ERG, to test retinal function. If she passed the ERG, she would be a candidate for cataract surgery and could have her vision restored. The ERG found her retinas are working completely normally, and Dr. Hoy scheduled Allie’s cataract surgery for this week. Please keep your fingers crossed! Allie is eight years old, so we’re hoping for many more years of vision ahead. Thanks to Joan and to the others who helped along the way, Allie is now enjoying an entirely new life with us here in New Hampshire! Allie looks like a sweet dog. It’s funny to see her in the same bed as Tanner. (But maybe they should try one of the larger beds)! It’s funny how they look so similar. It’s nice she has a friend already and feels welcome. She’s the perfect reason why people must provide for their pets in their will – so they don’t end up like Allie could have. Hope her eye surgery goes well and the lump being tested isn’t anything that can’t be dealt with. Will be waiting for an update. Welcome Allie! What a lucky girl. I can’t believe anyone would want to euthanize her. It’s a good thing she had the kennel owner on her side. Depending what part of southern VA she hails from, she may be quite familiar with snow. It’s a good thing she likes it, since our current two grew up with snow but hate it. It’s wonderful that she’s a good prospect for cataract surgery. And such a pretty and sweet dog too! Thanks Steve for all you are doing to help sweet Allie. Please keep us informed with her progress. Rolling Dog Farm–WE LOVE YOU!!! Your work over the decades has been amazing. So happy that Allie got a wonderful happy ever after with you and Alyane. She is so gorgeous!! At first I thought she was a Beagle but then I saw she is much larger. What a sweetheart, thank you for taking her in!